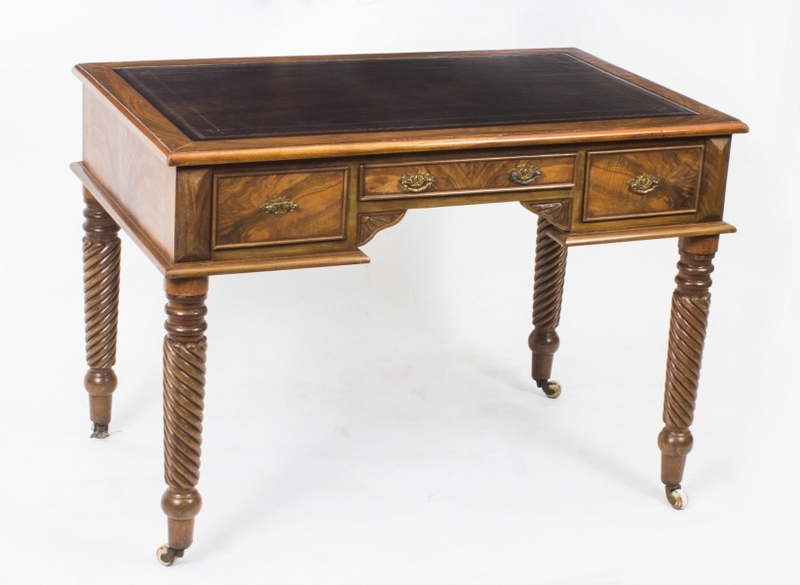 This is a fabulous antique writing table in figured walnut, made in the Victorian manner dated about 1900. 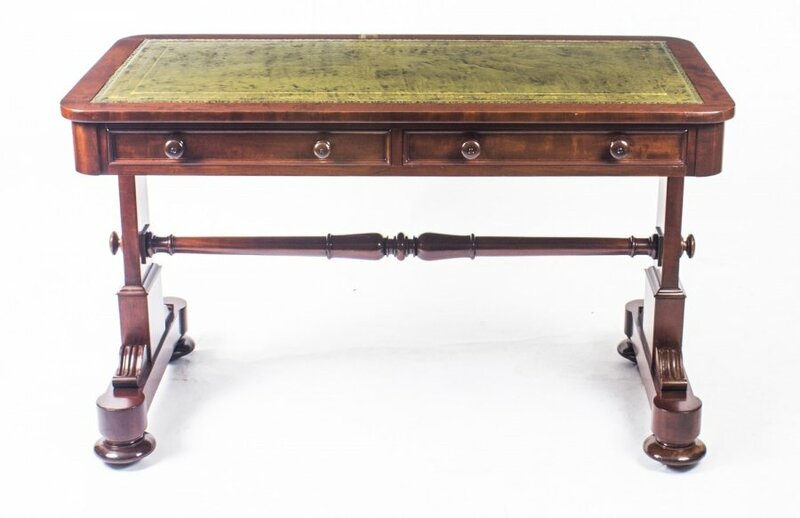 We are delighted to offer this wonderful antique writing table in such splendid condition for just £1,350. 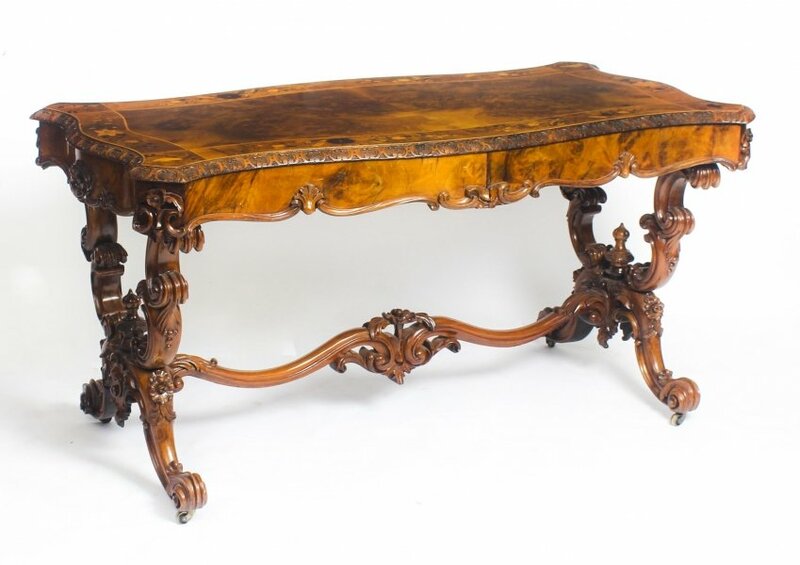 It has been superbly crafted from a particularly beautiful walnut with a very distinctive figure. Walnut has been used as a premier wood for furniture making for centuries due to its durability and its beauty. 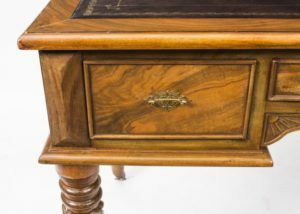 Figured Walnut and Burr Walnut (also known as Burl Walnut) are widely considered to be the most attractive types of walnut. Using walnut veneers takes a great deal of skill to join, match and blend them ensuring a balanced finish. 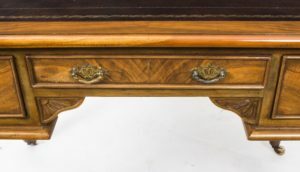 As such, burr walnut tends to be used on furniture that has been made by the most skilled craftsmen. 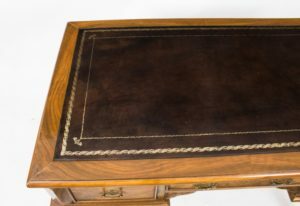 This antique writing table also has a very attractive hand-tooled and gilded brown leather writing surface fitted onto the top. 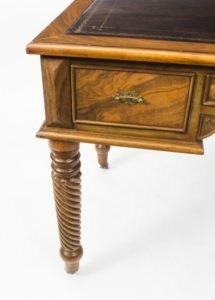 particular feature of this lovely desk are the hand carved barley twist legs which as an added bonus stand on their original brass and porcelain castors. It also has decorative brass handles which add a distinct element of style to this lovely piece. 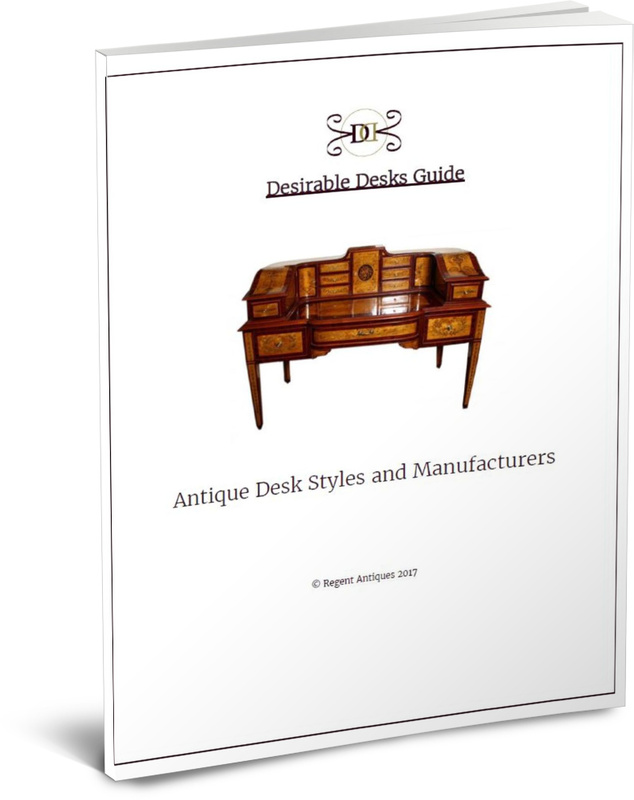 It features three ample drawers which also make it practical to use as a desk as well as a table. It is finished on all sides so that it can be placed in the middle of a room making it suitable for any location. 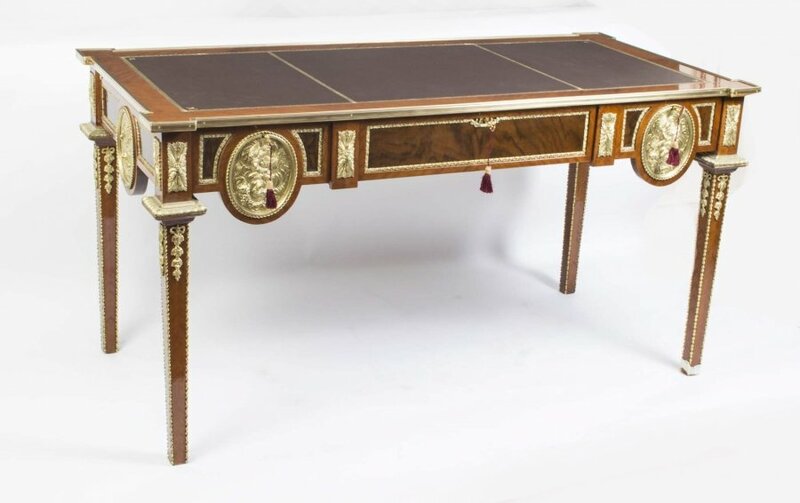 This antique desk is offered for sale in excellent condition, which you can confirm through the photos. Dimensions in inches: Height 2 ft, 5 in x Width 3 ft, 5 in x Depth 2 ft, 1 in – Kneehole Dimensions – Height 2 ft, 1 in x Width 2 ft, 11 in. We are always happy to organise a viewing at our North London warehouse, all you have to do is either email or call us on +44 20 8809 9605 to arrange a viewing. 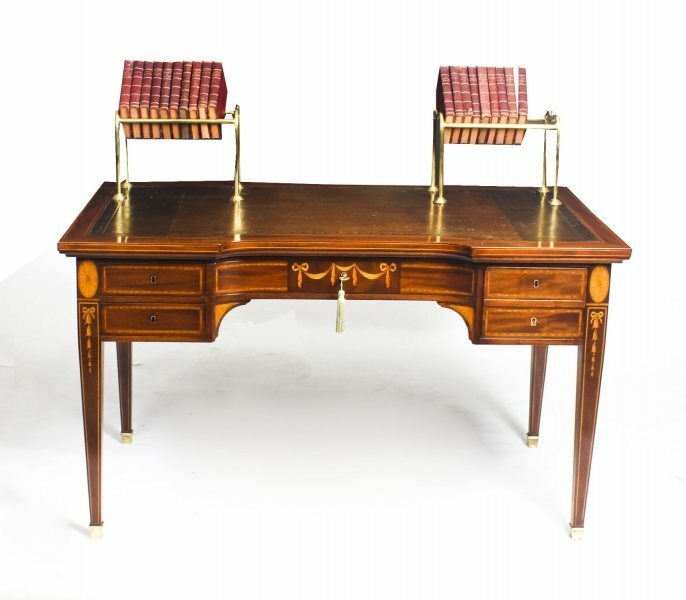 Whilst you are there you can also view a wide range of our other desirable desks, we have many in stock which are as equally impressive as this item. We are also happy to answer any questions you might have by email or phone. Just email or call to speak to one of our experts quoting item number 03217. See many more desirable desks here. We are pleased to be able to pack and ship our items to any location worldwide, but please do call for a quote first. We ship to mainland UK destinations free of charge. Please be aware that buyers are responsible for any customs duties or local taxes that are payable on items shipped outside the European Union.